Have you ever seen what eyes look like after they’ve been ravaged by LED grow lights? You maybe wondering will LED grow lights damage vision. In fact,any type of light can be harmful to our eyesight, if it is powerful enough. If anyone who has ever looked directly at a powerful light source, they’ll know this. However, some types of light are much more harmful than others. And even small amounts of certain light can damage our eyes. So,do LED grow lights harm our vision? The answer is complicated. Before we discuss the answer, let’s take a look at the complete electromagnetic spectrum. As we know, the range of light that is visible to the human eye occupies a narrow band. It is sandwiched between UV light (shorter wavelengths) and infrared light (longer wavelengths). Harm to human: the shorter the wavelength, the greater the harm to us. 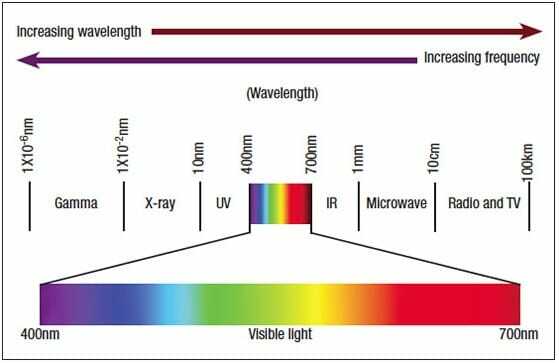 So, the wavelengths of light we need to worry about most are blue light and UV light. UV light is more dangerous than the blue light. UV light is further broken down into UV-A, UV-B and UV-C. UV-A is the closest to visible light. This means it has the longest wavelength. And it is also the least harmful. UV-C is the most harmful. Light from the sun contains all three, but our atmosphere filters out most of the UV-C light. Some UV-A light and UV-B light get through the atmosphere and cause us harm. That’s the reason we need to wear sunscreen and UV-blocking sunglasses. When it comes to grow lights, they all contain varying degrees of blue and UV light. HPS grow light contains small amounts. Metal Halide or fluorescent grow lights contain much more. For LED grow lights,the manufactures can choose how many UV LED chips used in the grow lights. As a professional LED grow lights manufacturer, AIS only used the reasonable quantity of UV-A LED chips. AIS’s LED grow lights keep a balance between enough UV-A light to plants and non-harm to human’s eyes. The most common negative effect of blue light is what it does to our sleep. During the day, blue light keeps us alert and awake. But exposure to blue light at night suppress the secretion of melatonin, which is a hormone that influences circadian rhythms. This makes us to fall asleep hardly and leaves us more tired and sluggish. Blue light can also negatively impact our vision. Our cornea does not do a good job of blocking blue light. So almost all of the blue light that hits our eyes penetrates all the way through to the retina. Too much blue light has been proven to damage light sensitive cells on the retina. This brings about changes that are similar to macular degeneration, which can result in permanent vision loss. The research so far is limited and we lack a good understanding of the long-term effects of too much blue light, and even how much blue light is too much. Nevertheless, it makes sense to err on the side of caution and take steps to protect our eyes. UV light causes varying degrees of skin damage, from premature aging, to sunburn, to cancer. It also causes damage to our vision and that is what most concerning to us here. All three types of ultraviolet light can damage our eyesight, but UV-C does by far the most damage. Luckily, our atmosphere blocks out most of it, and it is generally not emitted by most grow lights. Those that do contain UV-C light, only emit very small amounts. UV-B and UV-A are much more problematic. They affect our eyes in very different ways. UV-A light passes through our cornea and hits the retina, just like blue light. UV-B light is completely filtered out by the cornea and thus can not reach the retina. Because UV-A light passes through the cornea, it has been linked to conditions resulting from damage to the retina, like certain types of cataracts. It may also play a role in the development of macular degeneration. Since UV-B light does not hit the retina, it does not cause those same issues. Instead, it may help cause pingueculae and pterygia, which are growths on the eye’s surface. It can also cause a painful inflammation of the cornea called photokeratitis. This can cause temporary vision loss in extreme cases. Most full spectrum LED grow lights contain varying degrees of blue light and UV-A diodes. Very rare LED grow lights contain UV-B diodes or supplemental UV-B bulbs. These lights may also emit some UV-C light. If you just have a small light fixture or you don’t spend much time beneath the lights, you don’t have to worry. The UV levels are not high enough to cause damage with such minimal exposure. However, if you have powerful lights and you spend a lot of time working beneath them, I highly recommend you get some from of eye protection. 1.Don’t stare into your lights. LED plant lights with a lot of blue and UV diodes can be harmful to our eyes. The same goes for all-white lights that emit a cooler white light (5000 Kelvin and higher). The amount of harm an LED light can cause depends on the color and the intensity. Any powerful light can hurt our eyes if we stare directly at it. But that is an easy enough thing to avoid. Just don’t stare into your lights. I don’t recommend regular sunglasses if you are a professional grower. That is not because they don’t protect the eyes. Rather, it is because they are not designed for the unique light emitted from a grow light. This means that your plants will not look natural if you wear regular sunglasses. Grow glasses that are tuned to a specific spectrum will result in your plants looking completely natural when viewed through the glasses. This makes it much easier to inspect your plants and detect any discoloration or other signs of problems. Also, you need glasses that are made for the exact spectrum of your lights. General LED glasses will work for most of the lights that have a mix of primarily red and blue diodes. But they will not be perfect. As all of those lights have a slightly different spectrum. If you don’t care too much about the plants looking unnatural (i.e. pink/purple), then you can use a pair of regular sunglasses. Just make sure they protect from UV rays. Many glasses do not protect from UV-C. So make sure yours do, if you have a light that emits UV-C rays. Can LED Grow Lights Cause Cancer? There is some concern that prolonged blue light exposure could cause cancer. But this has not been studied. So nothing is known for sure. The same goes for UV light. What is known is that high levels of UV light can cause skin cancer. This is not something you have to worry about with LED grow lights. LED grow lights do not contain high enough levels of UV light. Just don’t lie directly beneath a powerful grow light naked for hours at a time and you’ll be fine. Are LED Grow Lights Safe For Humans? Yes, LED grwo lights are safe. As long as proper precautions are taken, grow lights are safe for humans. Are HPS Lights Bad For our Eyes? High pressure sodium lights contain a lot of red light, a small amount of blue light and very little UV light. For that reason, they are safer for our eyes. HPS bulbs are very powerful and can cause damage merely through their intensity. Please avoid staring directly into the lights. AIS LED is a leading LED lighting supplier with innovative green technology. We are specialized in the manufacturing of innovative, next-generation LED lighting solutions such as E27 E40 LED corn bulb, LED street lights, PL G24 LED lights, PL G23 LED bulbs, portable LED work lights, LED Flood lights,R7S LED bulb, LED stadium lights and so on. AIS LED is committed to providing high-quality, sustainable, green lighting solutions to the world LED lights market.